Review: Hare and Tortoise. Nottingham Playhouse. Neville Studio. – East Midlands Theatre. Review: Hare and Tortoise. Nottingham Playhouse. Neville Studio. 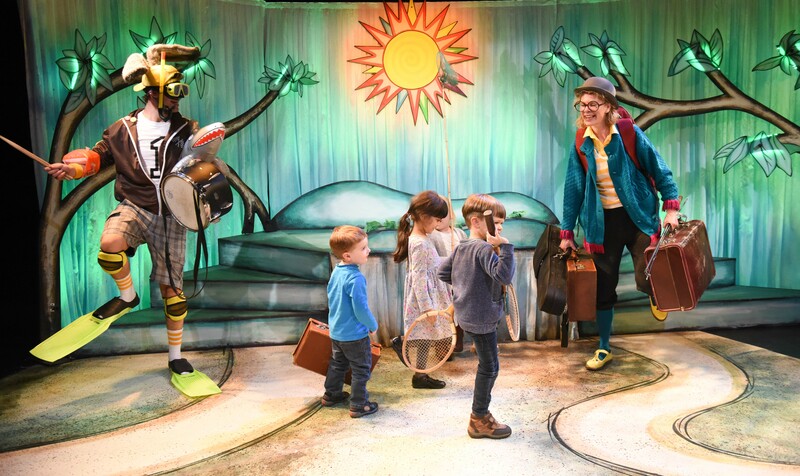 Hare and The Tortoise written by award winning playwright Brendan Murray and directed with aplomb by Allie Spencer is a total hit with the four to eight year old children it is aimed at. It would be nice to think that this show would run and run forever at the Neville studio at Nottingham Playhouse but it is playing until Saturday 2nd January 2016 only. 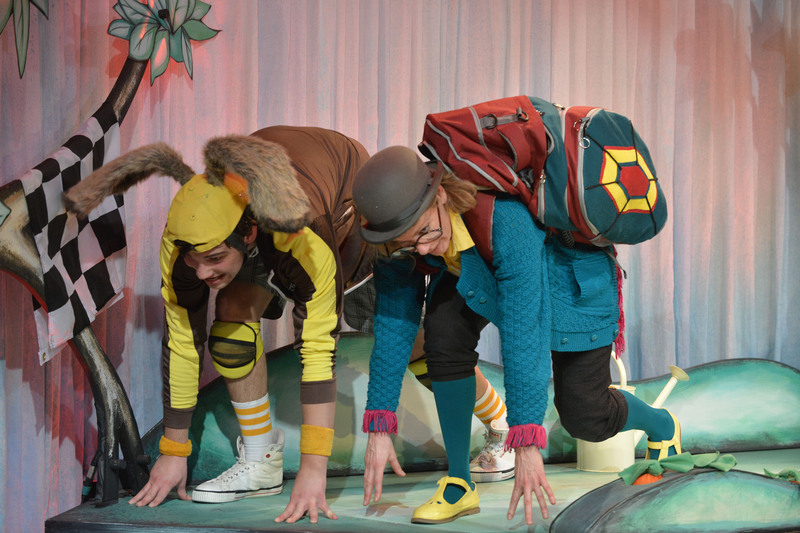 So, if you haven’t booked yet for this sweet and funny piece of colourful young children’s theatre don’t be as slow as a tortoise in booking or you could miss a treat! The beautiful set designed by Sarah Lewis is like a child’s most precious story-book come to life complete with added cushions for the kids to sit on and be almost on top of the action. The coming seasons are suggested by the actors adding pink blossom to the bare branches of two trees and green leaves and a bright fiery sun for the summer. Autumn and winter are brought about through magical lighting changes. A verdant hillock with natural steps leading to a path is the main playing area for the fun shenanigans of the titular characters – Hare and Tortoise. 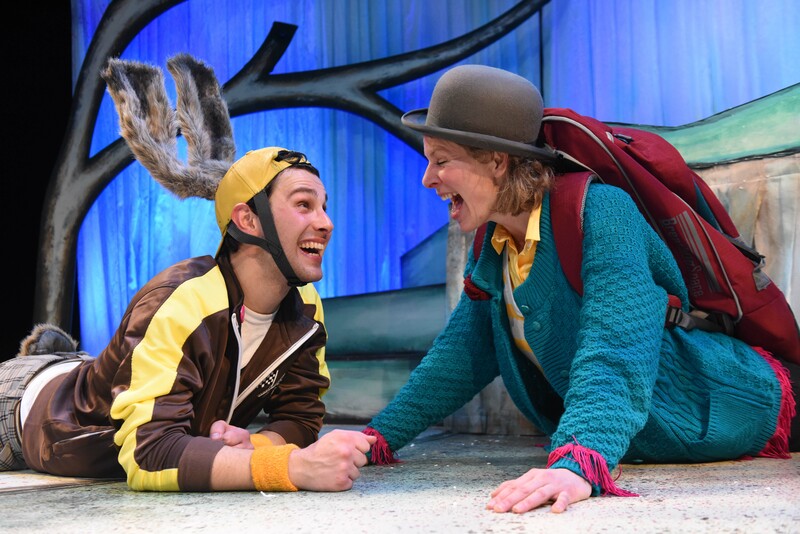 Animal friends Hare (Adam Horvath) and Tortoise (Elizabeth Eves) come together as Spring arrives and the process of hibernation awakens all the little dormant creatures. Horvath’s madly boisterous hare is a gift for the chuckle muscles. He has been around all winter but so desperately busy busy busy he hasn’t even noticed the beautiful bright stars in the clear winter sky. Nor has he marvelled at the sight of freezing breath escaping visibly from his mouth or the other wonders of a British winter landscape. Horvath’s Hare is constantly and super energetically on the go and the kids love him for his funny facial expressions and his Mr Bean style relationship with a stuffed toy- lookalike hare. Hare and Tortoise are great friends and Hare spends most of the short one act play badgering Tortoise to try and compete with him in a one to one race convinced beyond doubt that he will win. Tortoise, is the epitome of almost Zen like patience and Eves does an utterly brilliant job of gently teasing Hare into waiting until the right moment for the race and encourages him to appreciate life in the slow lane through patient understanding. There is a lot of warmth and hug-worthy moments in Eves’ performance. In the meantime they both go on a summer holiday together and get the kids involved in their perambulations. 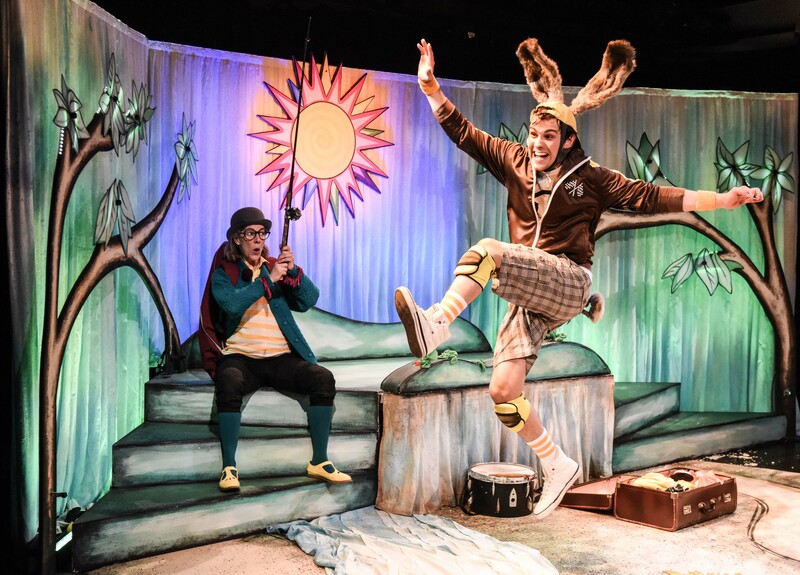 Hare and Tortoise is a very visual show full of innocent comedy, music and songs and occasional moments of reflection – totally perfect for the four to eight year old children that are its audience. 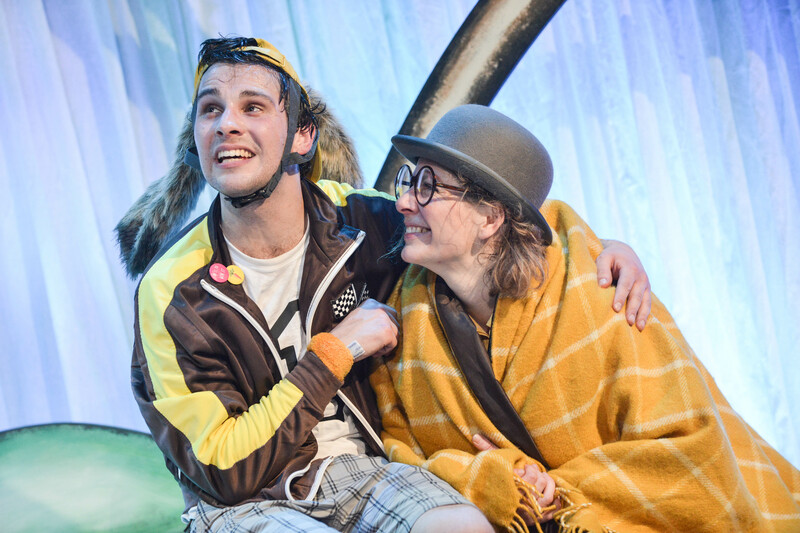 Stephanie Bartle’s charming lighting design and Adam P McCready (Poetical Machines Ltd) sound and music add considerably to the theatrical experience of Hare and Tortoise at Nottingham Playhouse’s Neville Studio. The additional work of movement director Amanda Hall gives the piece a lot of its energy. Overall – Hare and Tortoise is a complete and unbiased winner of a show!